It’s never too late for love and if you’re thinking you’re too old for online dating—think again. These days, the over 50 crowd is the fastest growing segment in online dating, and it’s easy to see why. Dating sites help you hone in on exactly what you like, and let your preferences be the guide. Put it this way, if you’ve made it this far in your life, you know what you like and what you don’t want to waste your time on. Whether you’re looking for your soulmate, companionship or just a bit of fun, we’re here to help. First things first, if this is your first time testing out online dating and you’re a bit worried about what’s on the other side of the computer, Zoosk is a good place to start. The site only lets you see other members’ profiles after you’ve set up a profile, so you know the other people are serious about being there. One of Zoosk’s standout features is its “behavioral matchmaking” algorithm that learns what you like and what you don’t like. In time, the system gets to know you, and sends you matches that you are more likely to be interested in. This makes the process less daunting, as you know that the system has put some thought—and data—into the matches it’s sending you. Not only that, but you can also filter your search criteria based on parameters like age, religion, distance from where you live, hobbies, and interests. If you’re in your 50s and ready to meet the person you’ve been looking for, Zoosk can help you get there. You can get a 6-month membership for $12.49 per month, 3 months for $19.98 per month, or 1 month for $29.95. You can sign up to Zoosk for free today. EliteSingles is the rare dating site that focuses on people who are maturely aged, so you’re already in good hands. A big draw of the site is that the vast majority of the user-base is educated, and the site verifies each and every profile to make sure its genuine. If you’re a bit worried about how to find somebody in your age range with your interests, EliteSingles should be able to put some of your fears to rest. The site requires every user to go through an extensive personality test in order to match users with people like them. Once you’re up and running, the site will send you 3-7 matches per day, which have been selected based on your answers to the personality test. The bottom line? EliteSingles is tailor-made for people who are old enough to want to cut through the games and find someone they click with on a real level. You can start using the site for free, but to communicate with other members you’ll need a paid subscription. A 1-month membership costs $99.95, while a 3-month plan is $59.95 a month, and 6-month plans cost $39.95 a month. Eharmony really goes the distance when it comes to putting compatibility first, and it shows. For 50+ daters, who have busy lives with work, kids, and the general hustle and bustle of life, this is a great perk. Sure, taking a 400 question test is probably not your idea of a good time. Still, if you’re looking for the right tools to make a serious connection, then signing up for eharmony is a step in the right direction. More than 20% of the site’s 33 million users are over 50, so you’ve got a nice mix of compatibility features and a vast client base to surf through. If you’re a bit concerned about safety (and who isn’t these days?) then you can rest easy knowing that all paid members can use the SecureCall feature to contact other users anonymously, as well as the RelyID feature which lets members verify their identity. In addition, you can see which users viewed your photos and profile, which can add a little extra fun to the mix. You can sign up to eharmony for free, but to enjoy all of the site’s features and communication tools, you’ll need a paid subscription. Get a 1-month plan for $59.95, a 3-month plan for $29.95 per month, or a 6-month plan for $29.90 per month. With OurTime, singles over 50 aren’t just part of the community, they’re the whole community. The site is geared specifically toward people your age, and specifically ones who might not have much experience with dating sites. OurTime keeps things simple, with an interface that’s quite simple to navigate, and customer service that is helpful and responsive. Additionally, since the site is dedicated to mature men and women, you won’t have to spend your time sifting through completely incompatible profiles of younger members who aren’t on the same page as you. You can filter your search results based on your preferences, and the site has also incorporated the swipe action made famous by Tinder (why should the young folk have all the fun?). It also lets you know when others visit your profile and shows you who they are. OurTime provides you with extensive tips on dating safety and has invested a great deal in securing customer data. Also, it puts an emphasis on real-world interactions and facilitating offline meetups. Since you didn’t grow up with the internet, this should be right down your alley. Signup to OurTime is free, though you’ll need to pick a paid subscription to communicate with other members. Choose a 1-month plan for $29.95 or a 6-month plan for $17.96 per month. If you’re looking for true compatibility, Match lets you narrow down your searches to people who match your specific preferences, and you can plug this into your daily set of 5 matches sent to you by Match. If you really want to nail down deep compatibility, you can set up a quiz of up to 20 questions which you can put on your profile for other users to answer. Match also organizes meetups in cities across the country, for when you’re ready to mingle in person. Match offers a free 7-day trial so you can try out the site before commiting to a paid membership. Paid memberships costs $12.99 a month for 12 months, $21.99 a month for 6 months, or $23.99 a month for 3 months. The best part? Match has a 6-month guarantee. If you don't meet a suitable partner within 6 months, you’ll receive another 6-month membership for free. For people over 50 who are looking for a relationship or a serious connection, SilverSingles is definitely worth a shot. When you sign up for SilverSingles, you’re taken through a lengthy questionnaire that takes a long hard look at who you are, in order to help the site determine which users could be good matches for you. With your “personality profile” squared away, you’ll receive 7-10 highly compatible matches every day. 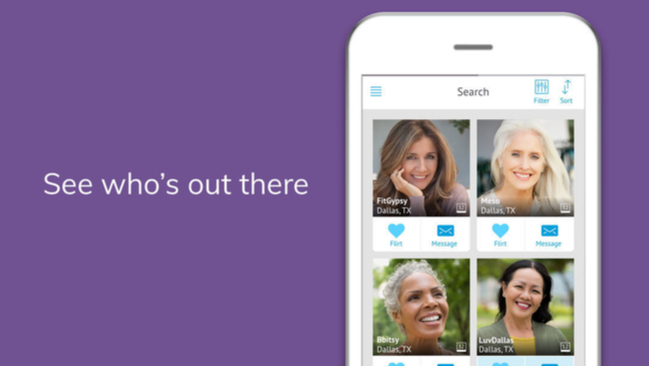 SilverSingles uses a handy system to help you find matches, putting a little heart on users’ profiles where there appears to be a shared interest. And when it comes to security, there are safeguards in place that filter out harmful messages, and every profile is checked by the site’s security team before approval. Sign up, build a profile and start using SilverSingles for free. Commit to a paid subscription when you’re ready to communicate with other members. Try a 1-month plan for $119.95, a 3-month plan for $57.95 per month, a 6-month plan for $44.95 per month, or a 12-month plan for $31.95 per month. Online dating is more popular than ever—especially for singles over 50. It’s no surprise really, online dating is easy, safe, and you get to specify exactly what you’re looking for. If you’re over 50 and looking for a way to find companionship, true love, or just a new friend, then online dating has more than enough options for someone just like you.